Adjusting for the "Rural Cooling Effect"
I spent quite a bit of time today ploughing through USHCN station data, doing a lot of grunt work. For example, I spent time aking a concordance of 1221 USHCN identification numbers with GHCN id numbers (they aren’t the same) and I haven’t seen a concordance anywhere. Most of it could be done through matching lat-long neighborhoods and common name starts. I got all but 3 matched through 3 fairly ad hoc rules. It was actually easier than the smaller Jones China concordance because the latitudes and longitudes were all correct or correct within a very close rounding error. One of the reasons for doing this is that Hansen et al have arrchived their lights value for GHCN id #, but not for USHCN id #. I’ve collated a data file for all USHCN stations which also looks up the GHCN metadata: lights, vegetation, topography. They have a lot of codes and metadata, but they don’t appear to have a code for parking lot or for whether an electric light is in the box with the thermometer. The data file is here. In the Hansen temperature calculation, he says that the long-term trends are defined by “rural” stations, defined in Hansen et al as having lights=0 according to their brightness index. Having collated the lights information with USHCN identifications, I then extracted the California stations with lights=0.. Details (excerpted from the larger file above) are here. There were 17 such stations, a couple of which we’ve discussed over the past few days, courtesy of Anthony Watts: BRAWLEY 2SW, CEDARVILLE, CUYAMACA , DEATH VALLEY, ELECTRA PH, FAIRMONT, FORT BRAGG 5N, HAPPY CAMP RS, INDEPENDENCE, LAKE SPAULDING, LEMON COVE, NEEDLES FAA AP, ORLEANS, SUSANVILLE AP, TEJON RANCHO, WILLOWS 6W, YOSEMITE PARK HEADQUARTERS. Lake Spaulding is one of the 17. It’s the one with the weather station attached to the boat in the parking lot. It turns out that until recently there was a much better location for the station, but it was recently changed to a site that is worthless. One wonders why IPCC has never stated that sites like the old Lake Spaulding are valuable for long-term weather keeping and at the total mismangement of the system in which Jones and Hansen have failed to oppose such changes. I’ve collated 7 different versions for each site: the three USHCN versions (areal, time-of-obs adjusted, filnet (Which is mainly Karl’s Station History Adjustment), 2 GISS versions: raw and adjusted and two GHCN versions: raw and adjusted. By and large the threefold adjusted USHCN version is approximately the GISS raw version. In each case, I plotted out the impact of the various adjustments from USHCN raw to GISS “raw” to GISS adjusted. A few patterns seem to emerge. First, in the majority of these “best” sites, there is a warm 1930s. The net impact of the several adjustment stages is to reduce the 1930s relative to the end of the 20th century. Probably the largest contributor to this was the USHCN Station History Adjustment, which is done according to a procedure of Karl and Williams 1987. (Karl, T. R., and C. N. Williams, Jr. 1987. 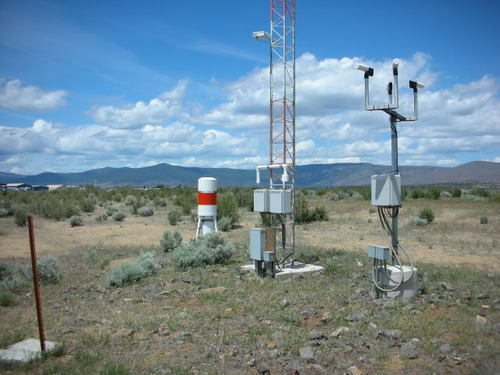 An approach to adjusting climatological time series for discontinuous inhomogeneities. Journal of Climate and Applied Meteorology 26:1744-1763. http://ams.allenpress.com/archive/1520-0450/26/12/pdf/i1520-0450-26-12-1744.pdf) Whatever the “good” reason for this adjustment, the main practical effect seems to be the lowering of past high temperatures. It also seemed that GISS was very likely to exclude past high temperatures from their collation, but were like a dog on a bone for past low temperatures. I’ll show one station to give a flavor of what I was doing. The first plot is a simple spaghetti graph of the 7 different annualized versions as shown below, showing warm 1930s in this case. The next is a plot showing 3 stages from USHCN raw to GISS adjusted: from USHCN raw t0 USHCN filnet (adjusted); from USHCN filnet to GISS raw (these tend to be very close) and from GISS raw to GISS adjusted. In this case, the USHCN adjustments collectively increased the trend by about 1 deg C and the GISS adjustments another 1 deg C.
The next figure disentangles the USHCN adjustments by type. The time-of-observation adjustment makes little difference, but the Station History Adjustment makes a large difference. USHCN station history information is described here , while the station histories are at http://cdiac.ornl.gov/ftp/ushcn_monthly/station_history . This file is extremely hard to read as it uses lots of indicators in Fortran punch card format. This entry was written by Stephen McIntyre, posted on May 28, 2007 at 9:36 PM, filed under Surface Record. Bookmark the permalink. Follow any comments here with the RSS feed for this post. Both comments and trackbacks are currently closed. I got a heretic idea. May be it would be vise to let weather stations to predict, well, weather, and for climate ‘€” both regional and global ‘€” use satellite measurements? The site was automated and moved to the end of the airport runway in 1996 from an area south of a hanger, west of the airport office behind the service area. 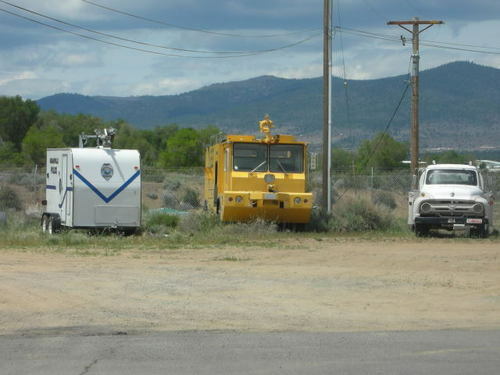 See the photo of yellow fire truck sitting on the former site location. The temperature sensor is in the PVC pipe, with a fan to draw the air over the sensor. According to the site manager, they only use the station data for local air operations. To his knowledge, none of the data has been reported since the site was automated in 1996. However, the equipment does include a modem and can be called by weather reporting agencies, although the site manager did not know if this was normal operations. The shelter used before 1996 was not painted, only white washed, according to the retried station manager in a phone call. #2. Hans, did you ever figure out how GISS made their adjustment to the De Bilt data. #3. Russ, do you have any information on the Independence CA site, also in the GISS 17. Steve, What do RC have to say about this and other “adjustments”? Not at this time, but will put it on the schedule. I am going to Blue Canyon today. Pictures later this evening. It looks like GISS cannot handle jumps properly and puts a gradient in place. Look at Uccle, Sneyers is the local (KMI) expert, but he doesn’t adjust for UHI change. And Sure enough somebody had used Lassen Mountain Hemlock. A guy named Briffa. Susanville, and some other less well known sites Mineral, Manizinta Lake, chester. I did find some other dendro who used Briffa Lassen Data. For climate data, he used the Entire Sacramento Drainage Division Data!! I think NCDC has a map. huge area and includes the stuff you’ve been looking at. It made me laugh. Something had to be done about those pesky 1930’s. Based on the names of the supposed “zero light” California sites, my skeptic alarm was set off. A number of the names are good sized towns / small cities (examples – BRAWLEY, FORT BRAGG, INDEPENDENCE, NEEDLES, SUSANVILLE, YOSEMITE PARK HEADQUARTERS). I included Yosemite HQ since the Yosemite Valley’s east end, where HQ is located, is essentially a suburban area for all intents and purposes. Unless the sites are like 10 or 15 miles from the named town, they are not zero light. A number of the remaining names are at least small towns of a few hundred to a few thousand. Interesting that other than Death Valley, none of what I consider to be California’s most desolate areas are represented – sort of makes sense, no towns or airports in such places. Just to name a few – the roadless areas of the coastal range uplands between San Francisco and the Oregon border, the high plains north and east of Susanville, the High Sierra, various portions of the Mojave and other eastern desert areas, the Carizzo Plain, the coastal range and transverse range uplands between San Francisco and Los Angeles. as: times of observation, equipment changes, location changes, etc. say whether the adjustments were good, or not good. and those two stations are rather close to each other. The breaks between periods are do to some change, and you will see many. not be a very readable document. With relatives living near Ft Bragg until recently, I know that area well. It’s a great example of microclimate sensitivity. Move a very short distance and the weather changes drastically, from foggy-cool-moist year round to sunny-warm most of the time. Ft Bragg has also seen dramatic urbanization shifts over the years, as the lumber and fishing industries ebb and flow. It will be interesting to hear the dynamics of the measuring station there! #14 Funny about those warm 1930s. Hansen et al. (2007) specifically go out of their way to point out that the the GISS GCM fails to simulate the level of “pesky” Arctic warming observed in the 1930s-40s. This *despite* the fact that they’ve already cooled it down by adjusting the numbers. Summary: They don’t know what caused that warming; but they’re certain it’s not internal chaotic variability in global/regional circulation patterns. This is in one of the “best” sites in the entire network. Taken at face value, this show the kind of migration that would be involved in order to accommodate to a change of 0.8 deg C at Cedarville – at least 0.4 miles and up to 2 feet in elevation. It’s a daunting prospect. WTH? 0.8 degrees C for 2 feet of elevation change? Hell I may just drive up there tomorrow to see what could possibly require an adjustment of this magnitude. This is starting to look like cooked books for an embezzlement scheme. If the site just moved with no change in altitude then aren’t we looking at a proxy for possible UHI effects (UHI being a function of site characteristics and man made impacts – buildings, heat sources, asphalt, etc). If the correction is .8C then surely the UHI effect has to be of a similar order of magnitude. 20, 21: One team makes hockeysticks, while another team puts points on the scoreboard. The only thing I know would be close to that would be if it was on the adiabatic warming side and went to the adiabatic cooling side. But to do that the “hill” between the two points, to be at .2 miles apart, would have to rise out of the ground like the Eiffel Tower. Better take a helicopter and a good telephoto lens. I visited the Qunicy Station and have pictures and some station history. I was there on a Sunday and the Tech responsible for the site was off, and I have sent an e-mail with some questions. The site was automated in 1988 or 1989. Re #25 Russ, I remain gobsmacked, agape, aporetic and agog at the close proximity of shrubs and trees to these stations. Trees and bushes create microclimates and, as they grow or die, those microclimates change. Whether its a cooling or warming depends on many factors but my guess is that a station placed, say, 10 meters from the drip line of a growing tree will on average become warmer over time. Nearby shrubs and trees may be OK for weather observations but they are poor neighbors for a climatological-quality site. RE27 When I’m doing my Stevenson Screen tests on paint, maybe I could haul in some portable shrubbery in pots and do a second run to do a second run. “Nearby shrubs and trees may be OK for weather observations but they are poor neighbors for a climatological-quality site.” Well they didn’t start thinking about climatology until 1941, and by then a good portion of the network had already been established. Maintenance of the entire network has always been ad hoc, and left to the local observer. The observers in the CWO are not paid, so the old adage of “you get what you pay for” applies here. At least the Quincy site is not right next to suburban development (as is the case with Tahoe City). Wait until you guys have a look at the Quincy data. years missing from each file were of course different. past and then tapering to nothing in the present day. The weird thing is with all the missing data Quincy makes it on the GISS list. Somebody who has more time and patience can try to figure this one out. With that, we finally understand what the Knights who say Ni were about with their requests for shrubbery in Monty Python and the Holy Grail. Obviously, they were early-type climatologists from the Medieval CRU at East Anglia, setting the ground for their precision thermometry. I wonder if Phil Jones has an old suit of armor in his closet. Re 25 & 26, Quincy station. Ever stand close to a telephone pole? They’re hot, the tar soaks up heat. I noticed this college student investigation of the effect of structures, including trees, on temperature. They compared near-ground temperatures of a plant 16 inches from a structure and then again 40 feet from that structure. The effect of proximity on temperature is rather dramatic. If the nearby structure is moving (as in growing taller and wider) then that proximity effect conceivably could appear as a trend in long-term temperature. RE32 Paul, the Quincy station was at the CA Dept of Transportation lot for awhile, and next to an incinerator. yes you read that correctly. This was documented by former California State Climatologist, Jim Goodridge. Here is a photo he took of the Quincy incinerator and the small max/min thermometer shelter/hut some years ago. The surface temperature record is a vortex of weirdness. Here are some Quincy plots aggregated from USHCN Daily. Plotting from the daily data set allows the frequency of missing observations to be simultaneously indicated. It seems to me that the large number of missing observations makes most of the data from 1973 to 1999 climatologically useless. So how does quincy make it into high quality sites? Hansen uses it but jones does not. Then again Gavin has said that 60 good sites are all you need. Gavin’s comment about “good sites” takes on a whole new meaning; doesn’t it? I wonder who came up with the axiom that pre 1970 station data prior should be adjusted down, and post 1970 station data should be adjusted up? Another brush covered site at Blue Canyon. The distribution of known adjustments is not symmetric ‘€” adjustments are more likely to be negative than positive. The most common reason for a station needing adjustment is a site move in the 1940-60 period. The earlier site tends to have been warmer than the later one ‘€” as the move is often to an out of town airport. So the adjustments are mainly negative, because the earlier record (in the town/city) needs to be reduced [Jones et al., 1985, Jones et al., 1986]. [Jones et al., 1985] Jones, P.D., Raper, S.C.B., Santer, B.D., Cherry, B.S.G., Goodess, C.M., Kelly, P.M., Wigley, T.M.L., Bradley, R.S. and Diaz, H.F. (1985) A Grid Point Surface Air Temperature Data Set for the Northern Hemisphere, U.S. Dept. of Energy, Carbon Dioxide Research Division, Technical Report TRO22, 251 pp. [Jones et al., 1986] Jones, P.D., Raper, S.C.B., Cherry, B.S.G., Goodess, C.M. and Wigley, T.M.L. (1986) A Grid Point Surface Air Temperature Data Set for the Southern Hemisphere, 1851-1984, U.S. Dept. of Energy, Carbon Dioxide Research Division, Technical Report TR027, 73 pp. The earlier site tends to have been warmer than the later one ‘€” as the move is often to an out of town airport. But I thought the UHI effect was negligible..??? The team does acknowledge that UHI exists. There claim is that the change in UHI is negligible, even as cities grow bigger. I think that Natchez MS US shows the effect of a station relocation in the late 1950s, when the station moved from the center of a small town out to an airport. About a 1C drop, which indeed needs to be adjusted from the record. But, should the city later encroach on the airport, some of the effect will return. In this case there was no return of UHI, because the town failed to grow. I’m familiar with this airport and, as best as I can recall, the station is away from vegetation, so there’s no vegetation effect either. Result – no temperature trend over the last 40+ years. What a crock! “Trust us” say the ‘climate scientists’, yet they come up with all of this unubstantiated, and very likely manipulated data. Refuse to allow examination or replication of it. Here at the nursing home, ‘climate scientists’ now have about the same credibility as politicians, and Jimmy Swaggart and his mates. If the photos and comments about individual stations mean anything it is that UHI has both a micro and macro component. Clearly any encroachment of buildings, asphalt, roadways, heat sources will have a local (+) effects (so also growth (-) and removal (+) of vegetation, irrigation (-)) while at the macro level there are the less proximate but potentially large effects of the surrounding densiity of buildings, asphalt and heat sources. The micro UHI effects are important because so many of the stations in the Arctic regions are in small settlements, where even small scale development can lead to measurable UHI effects. I assume there have been models built that include all these possible site effects. Can satellite readings be used as a source of “true” local temperature readings for areas around these sites? Does anyone have some good references on the estimation of all these site effects? Good for you and the folks at the nursing home Gladys! Suddenly, retirement and ageing is looking much more entertaining. I must be sure to find a “home” with high speed internet and wireless access. I only hope Anthony Watts and SteveM can keep up this lively pace. As always, nice work gentlemen. My addiction to this blog is never satiated. RE: #39 – Consider maximum snow depth. That’ll ruin the readings, since snow actually limits how low temperature can go within its mass. RE: #43 – Should it return due to growth, it will vastly exceed what was experienced mid town during the period prior to the 50s move. If it returns, it will return with big screen TVs, ubiquitous AC systems on the buildings, track/recessed lighting, PCs, gadgets, etc. Energy flux is much higher per capita than it was 50 years ago. Re #5 Steve M, I would certainly consider Independance, CA. 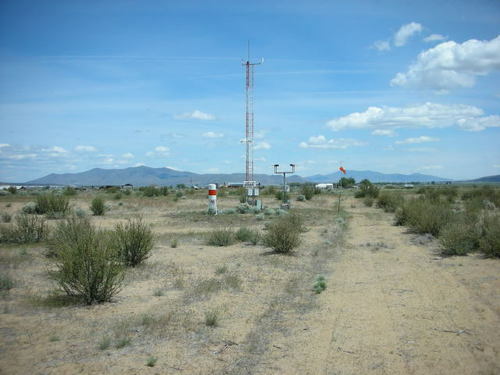 a rural site, especially if the weather station is at the airport. The town is about 8 blocks by 8 blocks and covers about a half a mile on HWY 395, with a population of about 800. The airport is north of town. More important is that most of surrounding land is undeveloped Los Angeles DWP property that was acquired during the early 1900’s. Re #15, Steve S might be thinking of Bishop or Lone Pine which have recent development. Russ would probably do a better job, but I could take some photos and inquire, if urgent this weekend. If not urgent, I will be in that area in a month or two. #49. As we see more of these sites, just because a site is “rural” seems to have little to do with microsite effects and the microsite issue seems to be completely awol in Team literature. I’m sure that urban airport sites are not as screwed up as the Marysvile site. It seems that many rural sites have big microsite problems and I suspect that this is one reason why there’s not as much difference between urban and rural sites. Rural microsite screwup effects sort of match urban heat island effects. Of course there are some decent rural sites, but USHCn and the Team seem to have made no effort whatever to identify these sites and worse, they’ve made no effort to preserve sites that are decent. Lake Spaulding is rural, but the present site is a mess and the screwup occurred in the past few years, under the IPCC watch. THe Independence site has a different pattern than some of the sites that seem to be pretty clean, and my guess is that there are some warts on it. It’s just a guess, but I’ll be interested in how it turns out. pronouncements on the temperature record.